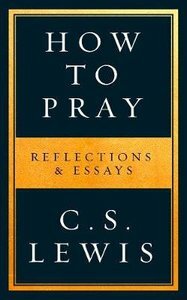 C. S. Lewis here offers wisdom and lessons that illuminate our private dialogue with God-prayer-in this collection drawn from the breadth of his writings. The revered teacher and bestselling author of such classic Christian works as Mere Christianity and The Screwtape Letters, C. S. Lewis here offers wisdom and lessons that illuminate our private dialogue with God-prayer-in this collection drawn from the breadth of his writings. C. S. Lewis's insights on Christianity and his reflections on Christian life continue to guide us more than fifty years after his death. How to Pray showcases Lewis's enduring wisdom on prayer and its place in our daily lives. Cultivated from his many essays, articles, and letters, as well as his classic works, How to Pray provides practical wisdom and instruction to help readers nurture their spiritual beliefs and embrace prayer in all its forms. While many people would like to speak to God, they often don't know how to begin. Lewis guides them through the practice, illuminating the significance of prayer and why it is central to faith. A welcome addition to the C. S. Lewis canon, How to Pray offers a deeper understanding of our personal tradition of prayer, our faith, and what is means to be a Christian. * C.S. Lewis is an internationally famous name, millions have read the Narnia books but maybe unaware of his adult writings. *Far from being restricted to the narrow religious market, there is an opportunity to introduce these books to the spiritual/ philosophical market.